Many people when taken away from the main power supply depend upon the good battery and charging set. They do not understand the characteristic of the battery which they are using in their caravan/RV/camper trailer and have no knowledge about the power supplied by the battery and its duration. The worst is that when the battery gets completely drained out and suffers an irreparable damage and cannot be charged again. This blog post deals with certain aspects and will provide information about the use of the battery and its maintenance. One has to clearly demarcate and understand that there are three types of battery which are commonly used. 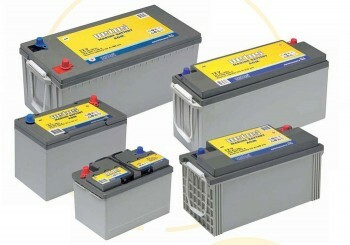 These are wet cell starter batteries, deep cycle batteries and a variation of deep cycle that is AGM. It is very important to understand the differences because each one has specific purpose and the functions. The starter battery is the one which we commonly under the bonnet of the vehicle and provides strong current to the starter motor for short time. Due to the requirement the manufacturing technique is different than the deep cycle battery otherwise its life will get shortened as the plates get deteriorate fast. Deep cycle battery is the one which is not designed for providing short heavy loads but is designed for occasional discharge below 50% threshold; this is the rule of the thumb to maintain long life of the battery. Deep cycle battery can be a wet cell also but the manufacturing is done with the electrolyte which is more of a gel which can be sealed easily. Sometimes these batteries are also called maintenance free batteries. Maintenance free does not mean you will use these batteries the way you want it. Wet cell deep cycle batteries perform better in hotter climate. Most batteries are manufactured in such a way that they can perform better in the places which has cool climate. AGM, Absorbed Glass Mat, is the best battery when you are camping because of its performance and long life. AGM batteries are quite expensive but even if it is expensive it has many advantages to offer. These batteries have been designed in such a way that it can absorb the occasional discharge below 50% level, even some cases it is even 20%, but the basic point is that all the batteries need recharging. The batteries suffer maximum damage when these are not properly charged and are allowed to get discharged. AGM has another property that it gets charged up faster and have capacity to take more charge which is very close to 100%. These batteries are very strong and can tolerate wear and tear as these were originally designed for the use of military. As these batteries are sealed, you can easily store these batteries in your car or a caravan or practically in all possible places. Even if these batteries are left unattended, you can charge the batteries again faster as these batteries being very tough do not deteriorate faster or lose the efficiency.